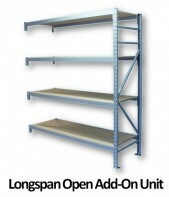 Store almost anything on longspan open units. Do you have small, big, long, wide or oddly shaped products? All of these are covered by Elbowroom’s longspan open shelving options. You can choose from our range of complete units, including our most popular configurations. 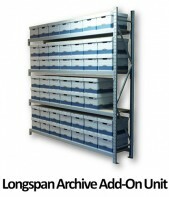 Longspan units are a practical option for mid-range storage due to their strength and size. These storage solutions will add value and space to many domestic and industrial work areas. 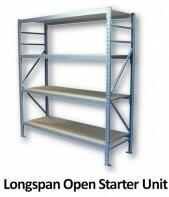 If our standard options aren’t quite right for your workplace, just give us a call – our friendly team of experts can help you design your own longspan shelving unit from our range of quality components. Customise your shelving to fit perfectly in the area you have available, so that you can maximise your floor space and achieve optimal productivity. Our longspan units are supplied in knock down kit form, ready for easy assembly (DIY). Easy-to-follow assembly instructions are provided for you in the kit. 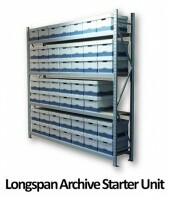 Looking for the most versatile, high-quality longspan shelving Brisbane has to offer? Get in touch with our knowledgeable team at Elbowroom by calling 1800 810 331. We can provide more information and help you determine what size and number of shelves will best suit your needs and space.